Sorry, for the short post from last week. But, honestly, there was nothing to show. Today, though, things are different. The picture doesn't really do it justice. For once you don't really see all the metalic gold that's in there. Very nice and shiny. I've made a mistake in the backstitches and did all the outside backstitch in Kreinik 002J instead of a DMC color. But I have to say, I really like it this way, so no harm done. In the mean time, I've gone back to do some knittings. Scarves are so far all I wanted to do, but knowing me, there might be a pair of sock coming soon. I've bought the wool originally for a Faroese shawl, but it just didn't work out the way I liked. So the big evil frog of backward knitting visited me and I ripped averything up. 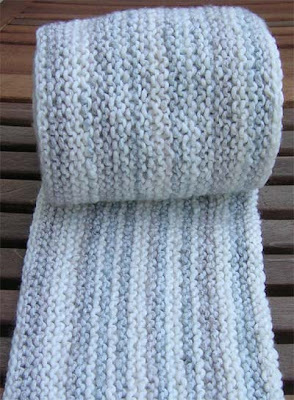 The scarf was knitted sideways, just a very plain garter stitch, until I just couldn't stand the boredom and had to bind off. It's nice and warm and soft, though. Never stopping at just doing one, I've started another sideways knitted scarf. 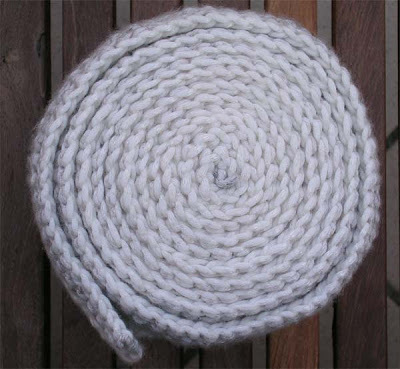 The pattern is from the latest issue of Knitty and it's called Henry. So far I've did 35 rows with 452 stitches. 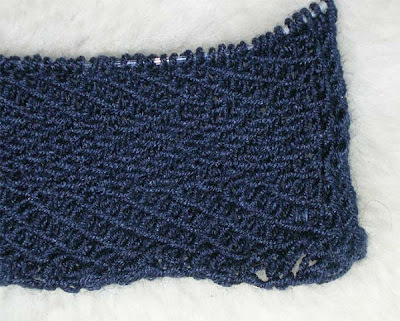 Knitted in a dark blue wool / silk / cashmere mix from Lana Grossa. Super soft to the touch. I've already pretty much reached the end of the first ball. The edge doesn't look to great at the moment, but there's trick to it, so in the end it will be all nice and pretty. Only 'negative' thing is that the wool is not 100% color fast. I've got blue fingers after only a short few rows. I don't really remember this happening, except with hand painted wool (where I sort of expect something like this happening. All the stitching is done, only (*gough, gough*) thing to do is the back stitching. For once I'm almost looking forward to it, as I know how cool it will look once the bs is there. Move on, move on, there's nothing to see. Sorry, no pictures this week. Nothing to show really. 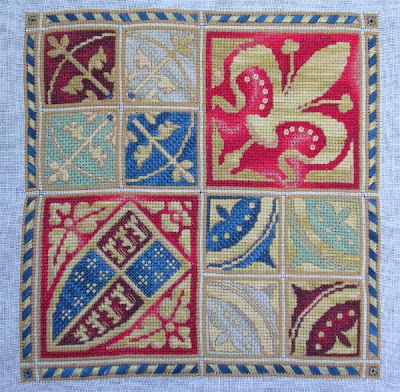 I had some hopes to finish Medieval Tiles this weekend, but then I had a knit attack, so I didn't stitch at all. And the knitting isn't finished either. I promise, there will be something next week. Scout's honour. Happy dancing here. 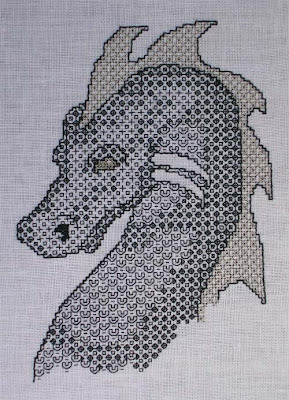 My Blackwork Dragon (by Dragon Dreams) was finished Friday evening. That makes it a little less than four weeks for it. During that time I only worked on her and on the Mini Cottages IV. 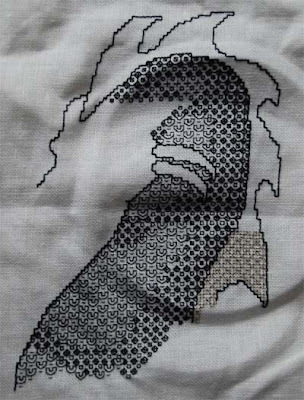 This was my first larger piece in blackwork (I sort of doodled a bit before) and I enjoyed doing it. - definitely an option when I'll go in another long distance flight. I'm now back on Medieval Tiles and making good progress. Got back about 24hrs ago. So far, jet lag hasn't exactly hit me - there's always hope it doesn't, especially when I go West. Going East is much tougher - I had a nap attack (as in, I can't possibly keep my eyes open for another second) in the afternoon for the first two weeks I've been in Japan. The customer was ... difficult, but all in all it went pretty well. 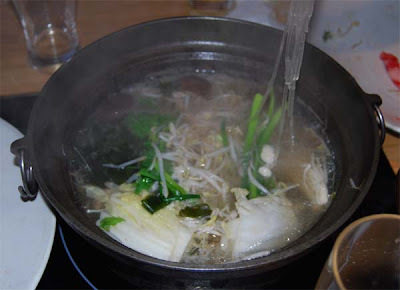 Last night we went back to Tokyo and went for Shabu-Shabu, a kind of fondue with beef and vegatables. Next morning I had to go up early (ugh) but at least I had a nice view out of the window. 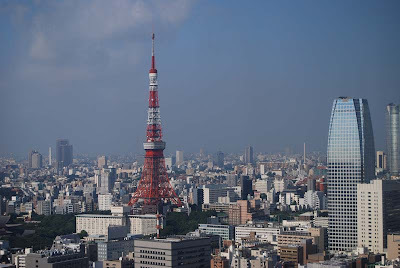 The tower is Tokyo Tower. Hard to believe that it is actually taller than the Eiffel Tower in Paris. I didn't stitch any on the 11 hours flight back, but back home, I've found some metalic thread I tried on the crest of the black work dragon. It's Kreinek 205C, the darkest gold I could find. I think it works okay. I've got some requests from the Needle and Threads BB to show my Green Dragon Bookmark. The original design is in red ('Red Dragon Bookmark' by Dracolair), but I had this greenish bit of fabric, so I decided to try a green variation. Most in some form of mix, some alone. And, yeah, it's pretty much the same every morning. I lasted for about a week, then I switched to some fruit and jogurth in the morning. Well, you can't accuse the Japanese that they don't like to experiment. Ever heard of potato chip ice cream? And why is it blue? Oh, I do love my new lens. I gave it a bit of a work out today and I'm as happy as can be. Need to buy a larger camera bag though. I'm not looking forward to lugging two bags with me all the time. So I need something bigger, where I can put stuff other than then camera + lens in. A self portrait for a change, while waiting for the cable train. 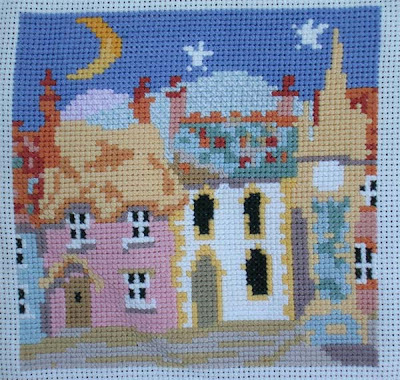 Can't wait for the wonder of the backstitch on this one - it's amazing on all the Michael Powell pieces. Brought a wronge color of yellow for the left roof - so will only be able to finish it when I'm back home.